Heads up teachers! Starting next week at Target teachers will enjoy a 15% discount on select classroom supplies! That’s right, teachers can get pens, pencils, crayons, storage, organization and more and save 15%; either online or at Target.com. Teachers will need to sign-up starting Sunday (7/15) to get your coupon code. Today from Amazon you can get a pack of 96 Dixon Ticonderoga Wood-Cased #2 HB Pencils for $9.96 – that’s $0.10 a pencil! Plus you’ll enjoy FREE Super Saver Shipping on your order over $25, or with your Amazon Prime membership. 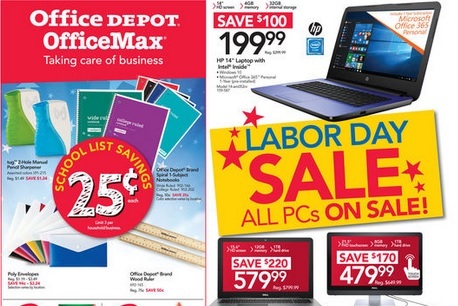 Office Depot has some great back-to-school penny deals that are valid through 9/02. You can visit your local Office Depot and pick up some great deals – like Office Depot Brand 1-Subject Notebooks and Wood Rulers – ALL for $0.25 each! Deals may vary by region, so visit officedepot.com/weeklyad to see which Penny Deals are valid in your area. Elmer’s Pourable School Glue, 4 Oz. Office Depot Brand Multipurpose Ream Paper, $6 – $5.99 back in Rewards = $0.01 after Rebate! Office Depot Brand Back-to-School Color Paper Reams $6 – $5.99 back in Rewards = $0.01 after Rebate! Office Depot has some great back-to-school penny deals that are valid through 9/02. You can visit your local Office Depot and pick up some great deals – like Office Depot Brand Filler Paper, 2-Hole Pencil Sharpeners, Crayons and Vinyl Pouches – ALL for $0.25 each! Deals may vary by region, so visit officedepot.com/weeklyad to see which Penny Deals are valid in your area. 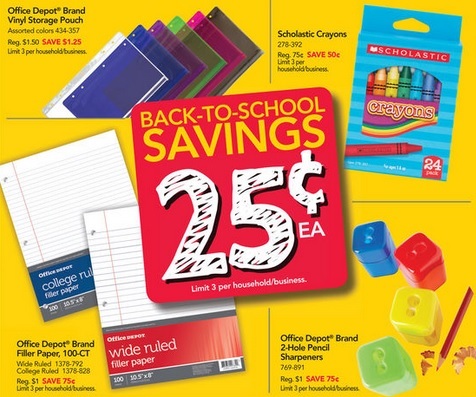 Office Depot Brand Back-to-School Color Paper Reamsm $6 – $5.99 back in Rewards = $0.01 after Rebate! Duracell Coppertop Alkaline Batteries (16 pack), $14.99 – $14.98 back in Rewards = $0.01 after Rebate!